The dental sector is a pioneer in terms of market volume and innovative capabilities. Prostheses used to replace or restore teeth are manufactured in laboratories by technicians that are requested by dentists and dental offices. As it is a segmented sector characterised by a high level of competitiveness, it means that only cutting-edge technologies are used. In recent years, titanium implants have become a regular solution for the dental sector due to their high biocompatibility and corrosion resistance. Many failures, however, still occur and this has made the industry show interest in the development of new alloys and solutions that can minimise weakness in the alloys currently in use. Most implant failures result from a loss of mechanical properties and biological phenomena t in the interface between the implant and the bone, such as the formation of bacterial colonies, the generation of fibrous tissue and the accumulation of implant particles. The latter are the end results of wear affecting implants produced by daily activities such as micro-movements that occur whilst food is chewed. When the implant is screwed into the patient´s mandible, moreover, there can be wear on the prosthesis and particles can be released. This explains why tribological properties are very important for implants. Likewise, body fluids such as saliva are highly corrosive and can favour the dissolution of implant alloys and release metal ions. This can give rise to an adverse cell response, infections, loosening of the implant, pain and, ultimately, rejection and the need to replace the prosthesis. It must be stressed that there is a growing interest on the part of the biomedical industry with regard to replacing the most common titanium alloys, such as Ti6Al4V (Ti grade 5) or Ti6Al7Nb, with alloys that are safer and have better mechanical properties in the form of high mechanical resistance or greater deformation capability. These alloys, moreover, contain aluminium that have been recently associated with degenerative diseases such as Alzheimer. In order to develop a technologically advanced solution that helps to reverse this scenario, IK4-TEKNIKER is working on creating a new generation of dental implants based on a super elastic titanium β alloy characterised by excellent mechanical properties. The technology centre also wants to make the surface of these implants more functional to endow them with bioactive and anti-bacterial properties allowing for osseointegration and a reduction in infections brought about by an accumulation of bacteria in the interface between the prosthesis and the bone. IK4-TEKNIKER, an organisation that has a high degree of specialisation in the field of surface engineering, tribology and coatings, is an expert as regards developing different applications that encompass a broad range of functionalities linked to different materials (metallic, polymeric, ceramic). Consequently, and in order to make implant surfaces more functional, IK4-TEKNIKER will apply the cutting-edge Plasma Electrolytic Oxidation technique (PEO). The PEO technology is an electrochemical oxidation process that produces a layer of oxide on the surface of an alloy thanks to the micro discharges applied to surface when the samples are polarised. The technique is based on conventional anodising, although higher voltage and current settings are used. The composition of the layers generated can be designed in such a manner that certain elements can be added when they are incorporated to the process electrolyte. 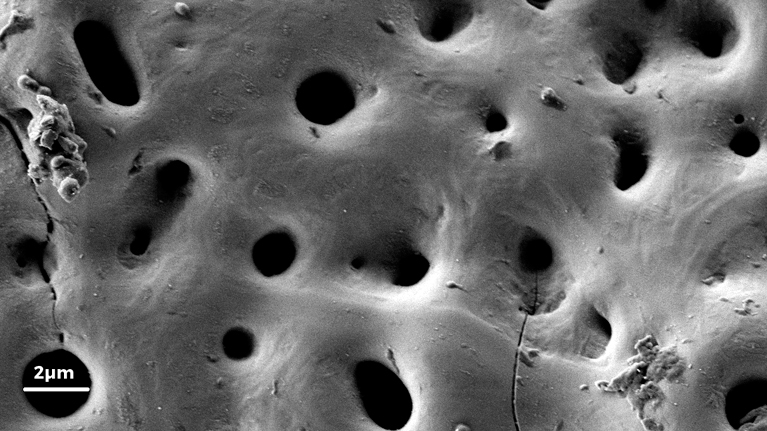 It is possible, for instance, to generate oxide layers with phosphorus and calcium to favour osseointegration or biocide elements such as iodine or silver to deliver anti-microbial properties. Layers generated by these techniques are ceramic, uniform, present a controlled thickness and are dense and porous. They also have a high level of adhesion to the substrate, high level of hardness and good wear resistance. Within the framework of this research, researchers will also be responsible for incorporating other elements such as calcium and phosphorus to enhance biocompatibility and osseointegration, as well as biocide agents to reduce infections. Coatings will provide better corrosion and wear properties for the new titanium β that has been developed. In order to carry out functional surface treatments by means of the PEO technique, the IK4-TEKNIKER team has formulated a number of electrolytes to obtain layers with the right chemical composition. Additionally, a process has been designed in which different current settings and process times have been tested to obtain layers with certain levels of thickness, hardness and roughness. The layers generated have been characterised by different microscopic techniques such as scanning electron microscopy (SEM-EDS) to determine their thickness and composition. Bactericide capacity of layers has also been evaluated by means of anti-microbial activity tests and ionic release resulting from contact with saliva has been analysed. Layer characterisation has also been supported by corrosion, wear and tribocorrosion tests to validate property improvements in titanium alloys after the PEO process. Once the design process concludes, IK4-TEKNIKER will scale the technique and adapt it to coat real implant geometries. The outcome of this work will give rise to dental implants that will offer multiple advantages such as superior mechanical properties compared to other alloys currently in use. The titanium β alloy, moreover, will not contain noxious elements such as aluminium or vanadium, thus increasing user safety. These coatings will increase corrosion and wear resistance and minimise ionic releases that could produce severe infections and rejections in patients. Oxide layers will improve osseointegration and diminish the presence of bacteria in the interface between the implant and the bone. Compared to other techniques currently in use, PEO will make it possible to generate very dense and hard layers compared to other techniques currently in use when coating parts with complex geometries. The research carried out by IK4-TEKNIKER is unfolding within the framework of the BioTiDent project that forms part of the MANUMET initiative of transnational R&D is geared towards advanced manufacturing in which 14 countries and 11 regions are involved.